In 2009, the total global revenues from international criminal activities were estimated at U.S. $870 billion per year. Since then, the rise of cybercrime and use of digital technology to circumvent existing laws and eliminate protective barriers has almost certainly caused that number to rise. In short, criminal business is often a very lucrative business. The cost to society of all this crime is equally high. Each year, countless lives are lost to human traffickers, drug dealers, smugglers, money launderers and other miscreants. In less secure areas, international criminal activities can destabilize emerging economies, up-end struggling political systems and threaten the peace of entire regions. In response, global legal and political communities joined to created a series of laws that prohibit their respective nationals from doing business with known criminals. In 1989, the leadership of the G-7 established the “Financial Action Task Force” (FATF). That international body is authorized to set standards and promote effective legal, operational and regulatory measures that are necessary to combat terrorist financing, money laundering and other threats to the international financial system. In 1990, the FATF issued its first set of “Recommendations,” a series of actions that each member country could adopt to deter this level of crime within its jurisdiction. Updated in 1996, 2001, 2003, and 2012, the Recommendations are regularly modified to be universally applicable and remain current and relevant in today’s complex global marketplace. access to a web of foreign intelligence services that facilitate the identification and mitigation of financial system vulnerabilities. FATF Activities in the U.S. In the United States, the Office of Foreign Assets Control (“OFAC”) is one of the agencies responsible for implementing FATF policies within the country. Its Office of Terrorist Financing and Financial Crimes (“TFFC”) coordinates the activities of American regulatory, law enforcement, policy, intelligence and diplomatic communities to identify and address illicit financial activities that threaten the American financial system. The entity also works with foreign governments and private entities, to ensure that all financial activities that affect the United States are subject to the FATF-related laws and enforcement actions. America’s long-arm statutes establish jurisdiction over all “U.S. Persons:” all American nationals and resident aliens; all corporations organized under U.S. laws (regardless of global location), and any person within the U.S. (31 C.F.R. § 598.318). All such persons are required to comply with OFAC standards including those that prohibit engaging in business transactions with “Specially Designated Nationals” (SDN) – known international criminals. Routinely screen their customer and client base to ensure that they are not doing business with SDNs. Failure to comply with either element can result in monetary penalties. The development of actual compliance mechanisms is left up to the individual company. 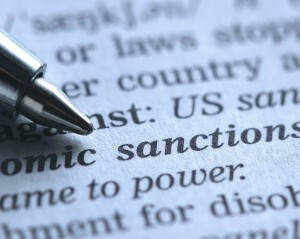 The OFAC standards do not describe specifically prohibited activities, but instead require entities to perform appropriate “risk-based” evaluations that are relevant to the nature of their business and its likelihood of encountering SDNs. Financial activities that come under the purview of the OFAC include those of insurance providers. In 2014, the global insurance industry experienced record high revenues, with total premiums equalling US $4.2 trillion. Both health and life insurance sectors saw gains, and two new markets (Emerging Asia and Latin America) experienced double-digit growth over 2013 statistics. Appropriately, insurance markets are essential aspects of virtually every national financial sector, and as such, are subject to the FATF rules and related American laws. For many American-based insurers, following the OFAC standards is a complex and complicated process. Recently, OFAC announced enforcement efforts against two American insurers for violations of the OFAC rules. According to the agency, both AXA Equitable Life (“AXA”) and the Kanawha Insurance Company (“Kanawha” – a subsidiary of Humana) had engaged in insurance transactions with SDNs. Each of the SDNs had begun their insurance contracts before being listed as SDNs. OFAC added the names of both criminals to the SDN list in 2009. In the years after that, however, neither AXA nor Kanawha reviewed their client’s records against the revised SDN list; each company had continued to maintain the contracts, in violation of U.S. Federal law. As punishment, OFAC went easy on the corporations, issuing them Findings of Violation that detailed the failures, but not imposing monetary sanctions because of their cooperativeness and voluntary participation in the investigations. The penalties available are US $250,000 (which is set to increase in the near future) or twice the value of the subject transactions. As a cautionary tale, the OFAC released the results of its actions against AXA and Kanawha to underscore the importance of compliance by all public and private U.S. Persons with America’s international anti-crime laws. By maintaining compliance, every entity, insurer or otherwise, joins with the OFAC in its fight to keep America’s financial system safe and secure.